Established in the year 1990, Milestone Electronics Private Limited is a leading company betrothed in manufacturing, exporting and importer a huge collection of Audio and Video Products. Appreciated enormously owing to their fine finish, high strength, exceptional finish standards, durability, easy handling and high performance, our offered range of products include VGA and Audio Switcher, VGA and Audio Multiplier, Audio and Video Splitter in a variety of stipulations to choose from. Using exceptional grade basic material and advanced machinery, our products are fabricated under the direction and supervision of professionals in strict compliance with market set guidelines and quality standards. Together with this, our products are checked on different grounds before finally shipping them at the doorstep of our customers. In order to carry out all our business operations in a hassle free manner, we have set up for ourselves a huge and well established infrastructural set up which is installed with all the latest machines and is divided into multiple departments to maintain efficiency. The departments in which our company is divided include manufacturing unit, warehousing and packaging unit, marketing and sales unit, quality control unit, r & d unit and a logistics unit. Working in an effective manner, these departments are headed by their respective managers who guarantee organized and timely completion of tasks in their department. Further the team we have hired endeavors to fulfill the assorted needs of our customers in the most satisfactory manner. 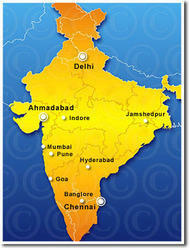 Owing to these factors we have been able to garner a huge customer base across the globe. Our corporation is mentored by Mr. Sanjay Randeria, under whose direction and leadership, we have been able to become one of the top organizations of the nation. Together with this, his intelligent business strategies and client friendly business policies have helped us in taking our company towards newer heights of success. With over 2000 customers served in India & abroad, our clients include Engineering Companies & Large Multi National Companies (MNC). If you have a Computer Interface & Connectivity Products requirement, We have a product for you. "Quality Products, Assured Service & Customer Satisfaction"
Our Products include Latest Innovations integrated into machines as per our customers requirement and feedback. Trained & Experienced Manpower and Customer Service are our benchmarks.